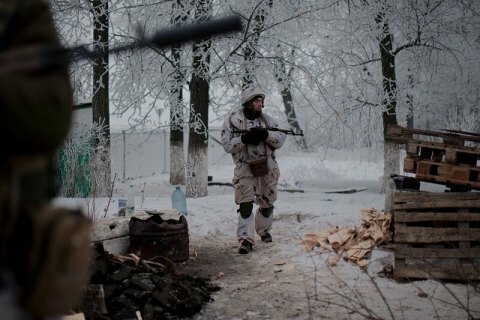 The militants waged 122 attacks at the positions of the ATO forces. Over the past day one Ukrainian soldier was killed, four wounded and one traumatized in the zone of the antiterrorist operation in Donbas, the ATO press center reported via Facebook on 7 March. A total of 122 shelling by militants were recorded. On the Mariupol sector, enemy tanks and artillery shelled Vodyane and Lebedynske. Hnutove, Novotroyitske, Krasnohorivka, PavlopIl, Vodyane, Novohryhorivka and Shyrokyne were shelled with mortars of various calibers, grenade launchers, anti-tank missile systems and small arms. Also, militants fired mortars at Hnutove, Chermalyk, Talakivka, Pavlopil, and Vodyane. Berezove, Vodyane and Shyrokyne were under the fire of infantry fighting vehicles and snipers. In the Donetsk sector, militants fired mortars of various calibres, grenade launchers and small arms – at Pivnichne, Pisky, Zaitseve, Verkhnyotoretske, Kamyanka and Nevelske. An enemy sniper sniper was active in the area of Kamyanka. An IFV shelled Luhanske. On the Luhansk sector, the 152-mm artillery of the opposite party pounded Krymske. Novooleksandrivka, Popasna, Novotoshkivse, Krymske, Troyitske, Orikhove were pounded with mortars of various calibers. Militants fired grenade launchers at Troyitske, Novooleksandrivka, Novozvanivka at Krymske. On Monday, March 6, Ukrainian repair crews could not restore the damaged by fire power line and water filtering station feeding Avdiyivka and Donetsk. The city remains without electricity and water.